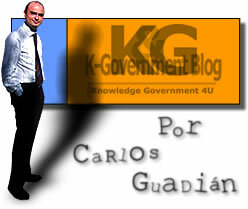 K - Government Blog is a Carlos Guadián Orta's initiative, in order to to share and transmitte information and knowledge on all what implies the application of the Information Technologies and the Communication (ICT) to political, social and administrative processes. At present, he works for TAO- gedas as Communication and Contents advisor, collaborating also with Própolis Club. Gates instead of burlarte, you could help!!! ¡We always go a step behind! In a 6-0 the votes, commission decided to regulate only paid political ads you please on to another person's website. The decision means that bloggers and online publications will not be covered by provisions of the new election law. Able Internet bloggers and individuals will therefore be to uses federal the Internet to attack or support candidates without running afoul of campaign spending and contribution limits. There are initiatives that must consider and of course to give all the possible support them. In this case it is Nicholas Negroponte who impels the beginning of program of the computer of one hundred dollars. If it really interests to help to him Why it does not invest in the project so that one becomes totally effective? And I say to invest so that it cannot follow with its strategy to create software captives so and as already I mentioned a time ago with "Social counterattack of Microsoft"and"Microsoft versus. Free Software"
I have arrived does already awhile of Santiago de Compostela, where this one weekend has been celebrated first socialist days of network of blogs. I do not go to relataros which has been these two intense days of tables of communications, to char them and workshop. For that already has done it, very well by the way and on the fly, Mari Light Naredo in Ovetus and Ricardo Cavero in Europa. Other references to way summarize, already introduced by Lourdes Muñoz in her blog, Enrique Dans in his or the entrance of "El agujero de gusano"
These days have the added value in which the materialization of a network initiated in the virtual thing, finishes being expensive. A pleasure has been everything to know personally mentioned-above and others like Pepe Zaragoza, Enrique Dans (The Blog de Enrique Dans), Carmen Sanchez Carazo (Derribando Barreras), Fernando Jáuregui (Ocio Crítico), Montse Boix (Women in Network), Enric Sopena (The Plural One), Marisa Soleto (Foundation Women), Jose Cepeda, Zuriñe Vázquez (Restlessness mosaic and calms) or fireproof Miguel Segovia Angel. As also it it has been to return to talk with Toni Roig (Palma amb ma esquerra) and of course with Enrique I castrate (Blog de Enrique Castro), that is the one that has mounted all the shed. And how not to thank for to Noa its presentations, Lorena to be ours cicerone and Manolo along with to have done the others that everything has been an pleasant experience. In conclusion, a very positive experience in all the senses and I hope that for the rest also it it has been. And of course the one that it wants to unload the presentation that I have used for my factory is possible to be unloaded from K-Government Group. What is of your interest!!! Must be sold the public administrations through their presence online? The past Wednesday 22 of March Própolis - project led by Tao-gedas and Muliplica - e Infonomía they made days on the limits of the marketing that the public administrations you could make on themselves from its presences online. The administrations begin to have important levels of traffic in their presences online. They must take advantage of that traffic to transmit certain values? in order to sell a certain image of the territory that represents? in order to present projects it nails of the legislature? in order to sell the work of its teams of government? The today entrance is autobiographical and has its cause in post of Julen in Consultancy Craftswoman in the Network "People nail in an organization". It has arrived to me deep, it has touched the heart to me, it has made me remember thirteen years of labor experience. Why? You will ask some. And you are not the unique ones!!! Normally when I explain this history the first reaction of people is of incredulity. But if, it is certain. Certain as the same life and how says in many occasions "the fiction surpasses the reality". The reception person is fundamental to accede to the knowledge of whom she is who back in terra incognita of the company. Who knows to whom one resorts why things, who is arranged to throw cable, who is amiable when it takes the telephone, is ogro, who is unfaithful to its woman, who is the person who knows more of such-and-such thing. All that knows it because it is the center of immense networking, formal and informal, whose main node is under its possession. This communications center is the neuralgic point where concealed ideas, conversations converge, sometimes bad humors and emotional explosions and even some that another tear of that never you you waited for it. This person, great injustice, is habitually infravolarada. Like almost always, its value becomes evident in case of absence. When this person is not, something lacks, sometimes difficult to include/understand, to fall in the account. It lacks a point of connection between dispersed neurons by different areas. Are not great destructions, but they fail the communications and that is, every day more, a true risk. It can cause that a project flows or that is clogged. Its mark of professionalism is, mainly, in the smile of its lips. For who sees it and for who does not see it. The smile is the hyperconnection with that is to the other side, is of the telephone, the electronic mail or the counter of the reception. Because this person has a great quality: it knows that its mission is to connect and the connection is health sample. Its organism is optimized to feel comfortable when it spins conversations. At this moment it obtains a certain state of flow, difficult to include/understand for that it does not occupy that position. It does not present/display tension symptoms before circumstances that to other would make us shake. She is a customary person to that the moment is short. To that they are only outlines of great projects which can happen through its hands. For that reason there is no time to generate tension. If there is much traffic in its surroundings it puts all its machinery on approval. When these circumstances of certain pressure occur, all we realize of which it is worth that person. The reception people know who is who. They know names, last names, departments, areas, districts, quereres, hatreds, relatives of and others, great and small clients (all and each one with its name), nicknames, privacies, shames. They know too much many people. In the house of Johari, they have an enormous window to see the others. And that always is to play with advantage. I would like to consider with all and each one me of the qualities that Julen enumerates, although I know of the certain one that not always they are possible to be counted on all those abilities. Then, I from year 1991 to December of the 2004, that is to say, until year ago and little means I worked like manager, like the person of reception of a sport installation. In concrete of the Municipal Polideportivo of Santa Eulàlia in Hospitalet of the Llobregat, managed by Agrupació Esportiva Santa Eulàlia. In this installation my main function was the reception and attention of all those people who approached the street Verdaguer Jacinth. Trainees, subscribers of the gymnasium, sportsmen federated of some of the sport sections, parents accompanying to its children and people and more interested people actually of the physical activity. During years, I had opportunity besides to make all type of works. From helping in maintenance tasks and therefore of having to tile floor tiles, to place a shower diffuser, to make mortar to raise a partition, to reduce a door so that the ground does not graze, to cut to a pipe on time so that a simple escape did not reach more or the always singsong but necessary action to pass the broom and mopa to present/display a correct hygiene to all the one that that way appeared. Evidently also they were many tasks of administrative, but already towards the last time and thanks to the arrival of computerization and the connectivity to Internet, I could get to develop abilities that now I can value like important for my professional development. Throughout this time, although there were sabbatic years, in which to the study and preparation one talks about, I could study and graduate in Management and Public Administration and receive the master's degree in Political Sciences by the University Pompeu Fabra. These united factors along with a constant curiosity by the new technologies pushed to me to unite those subjects that raised my passion and that have gotten to become hobby for me. E-Government, the electronic administration, the application of new technologies to processes of citizen participation, the policy and so many other subjects were object of constant reading. There the accumulation of information and trying to find a form to be able to manage it and to gather it pushed to me per November of the 2003 to start up K-Government. I must recognize that this decision was crucial in my life, that along with "San Google", I call it I took root and now you will understand why, she has made possible that she finds me where I am doing what I do. Thanks a K-Government and to the easy indexing that has blogs they located to me from TAO-gedas, concretely the one that is at the moment my direct superior, Daniel Lorente and our present chief of a main directorate, Xavier Llinares. They saw the work that until then had come developing as hobby and they liked. They liked so much that offered to me to unite me to an equipment in which I feel of wonder. An equipment in that you do not have to anybody fiscalizándote over the shoulder, an equipment in which the confidence is fundamental reason why the performance initiative well is considered and hour the flexibility guaranteed. An equipment where the opinion of the others considers and looks for its collaboration. An equipment that has made me feel like in house. But by all this I do not want to forget to me that fuí during so many years "the reception person"and from I want here to erect my personal tribute to all those that receive to us with a smile, to all those that the work can facilitate us so that they are expert of many things that the others we ignored, to all those that are the image that a company or administration gives, to all those that provide that to which they are not forced but that thanks to the personal bows that they establish with that that way they happen do it with the greater taste of the world, to all those that they cheer the day to us and that greets so much to you if you go become absorbed in thought in your thoughts as if directly you salute to them, to all those that learn your name and personalizan the treatment to do it more human, near and pleasant. Only it would request to you that from now on consider those people, greet them, you learn its name, you know them. But mainly that you consider one more a person of the equipment, so that that person is a very important piece and most of the occasions is had it forgotten in reception, as if a furniture more it was. If they do not take advantage of Web 2.0 Why not to do it we? Then good, if we joined all these affirmations we reached the conclusion that we are those who we must take advantage of those tools that to us Web 2 offers.0 to fortify our political activity, we will reach the conclusion that if they are not they we will have to be. And this conclusion has been the one that has impelled the creation of Essembly. It has at least been the idea that impelled Joe Green that being known Mark Zuckerberg, the founder of Facebook.com and having to its backs the salary participated in the presidential campaign of Kerry it decided to start up Essembly. 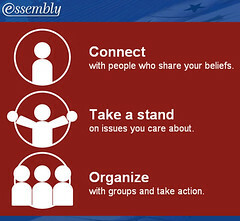 Essembly it is the first social, nonin favor network of political character. It is a network that is based on the affinity by political profile, that is defined with making discussions, but mainly with the acceptance or not of affirmations that the other members make. It is possible to be entered discussion on any proposed topic on the other hand, or by the proposed ones by one same one. A good way that can include the action of the citizenship outside the norms and often rigid ideology and that comes given by the parties in a sense top-down. How minimum it is an interesting tool and that I am sure that if had an retort in Castilian would have enough acceptance. I am conscious that the political structure is totally different in the United States and Spain, the representative system of parties and is very different and that the individual action always is primate much more there who here. But since we complained whenever our politicians do not do the correct thing Why not to do it we? PS, if it pricks the curiosity and you want to you to show the nose to clikar in the following connection for registraros HTTP://www.essembly.to com/register/code=k-government Invitation is not needed and you will enter the group directly that I have formed. Information through Personal Democracy Forum Technology is Changing Politics. Today it is the turn of the Anglo-Saxon world. Via Simon Dickson I arrive at blog of David Miliband, minister of Communities and Local Gobierno. As you can see not only is in Catalunya where responsibility politicians open his blogs, although Maragall to my way to see it would have to reenfocar its activity in the blogosfera. Its posteo very is spaced and it has not finished satisfying the expectations with those who we saw in its initiative something to follow by others of its condition. You do not say to me that yet what it is happening does not have things that to explain without having to pass official channels established. And I talk about the external ones, so that evidently what writes, or they write to him must pass by the usual cabinet of communication. But good, the case is that the case of Miliband is only the end of iceberg. Via e-Government Bulletin I have the news of other two interesting initiatives. This time a step further on. Podcasting that according to Professor Stephen Coleman of political communication of the University of Leeds it can get to constitute an important tool to increase the citizen commitment in the political life. In order to illustrate it shows it to us Politics on Demand in the United Kingdom, that already constitutes like the directory of podcasting of British politicians and in the United States another one in the same sense, Audio Activism. We make timid attempts. They mount chats with the citizens but not at the level that they do. And if not that asks a to it Tony Blair that uses the Messenger in order to make chats with British citizens. Or they are used blogs but not with all its utilities and possibilities opened to the public. We go that as always we are a step behind. And that that it will not be so that to Zapatero the proposal has not made him open blog, but nor case. That is, that at the moment nor to speak of podcast. And as I say in the title of this entrance ¡We always go a step behind! The weekend that comes has invited me to participate in first workshop on blogs that organizes the Network of Blogs Socialist. They will leave me "to speak awhile" Sunday in the morning, when I make a workshop on resources for blogs. I wait for veros that way!!! The days promise by the poster that present/display. I hang to you next description, conditions and program ¡What are of your interest! These Days will be made on technologically advanced surroundings, we will have wireless connection of broadband for todos/as the participants, we invited to you to that you bring your portable ones, if is not thus, we have computer science Classroom supported by the Faculty of enrolled Political Sciences to los/as to the Days. We will start up a novel system of forums and interperformance through tools IRC in all char them, interactive exhibitions, presentations multimedia and more surprises. The inscription is open until day 21 of March, the price of inscription of the Days is of 35 euros, in her is included, free access to all the communications, food of Saturday, different coffebreak, access to the Network in the enclosure of the Days. We have lodging in Hotel of 4 stars (optional) to a reasonable price, we will put ourselves in contact with los/as enrolled to formalize so much the inscription to the Days like the lodging. Mrs.. Dean of the Faculty of Political Sciences Dñ. Lagares Snows. Mr.. Mayor of Santiago D. Xosé Sanchez Bugallo. Mr.. President of the Xunta of Galicia D. Emilio Perez Touriño? 11.30 "Binnacles a new form of communication"
D. Taracido Marks, note Book Publisher ""
13.00 "Experience of the Socialist in the network"
D. Pepe Zaragoza, Secretary of Organization PSC. D. Jose Cepeda, Secretary Innovation PSM-PSOE. D. Jose Manuel Lage Parliamentarian of PSdeG - PSOE. 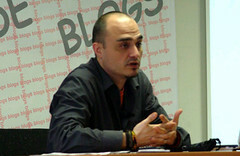 15.30 "Development of the vestibule Network of Socialist Blog"
D. Vidal Diaz Cotón. Director of Arcade Consulting. 17.00 "Experience of Elplural.com "
18.30 "Blogs: the new communications and the State of the Well-being "
D. Fernándo Jauregui, Journalist and Director of Ociocritico.com. D. Josefa Towers, Director of Formation of Foundation Eleven. D. Juan Antonio Districts, Socialist Deputy. 20.00 "traditional Mass media versus. Mass media in network "
D. Jose Mª Pereiro, Journalist of pais and the TVE. D. Pinto Juan Luis, Professor of the Faculty of Political Sciences of the USC. D. Fernando Salgado, Secretary Xeral de Comunicacio'n of the Xunta de Galcia. 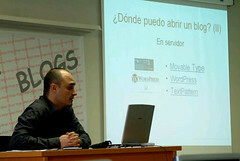 10.00 "Factory and resources for blogs"
D. Carlos Guadián, Of K-Government, associated Binnacle to "lasideas.org "
11.30 "Analysis on the blogosfera"
13.00 "the Universal Expo of Zaragoza, from the technological innovation"
14.30 "the women in the Network, key Internet in the equality of opportunities"
It moderates: Dñ. Lourdes Muñoz Santamaria, Socialist Deputy. Dñ. Marisa Soleto, Director of the Foundation Women. Dñ. 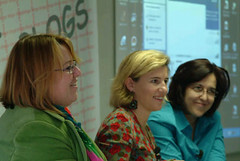 Montserrat Boix, Journalist of the TVE and coordinator of "Women in Network"
D. Taracido Marks, Publisher of the popular site of Internet Note book. He is in addition promotional to initiatives in the Network such as the Magazine Warehouse. 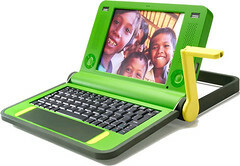 Note book is an influential site of Internet, where daily a compilation of the best contents is made in the Network. Dñ. Carmen Sanchez Carazo, socialist Councilwoman in the City council of Madrid. 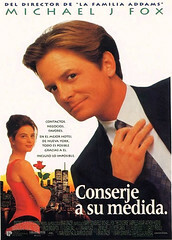 She is Medicine Doctor, Máster in Bioética. 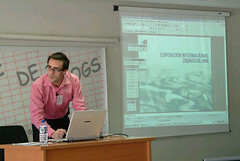 Consultant of the Agency of Protection of Data of the Community of Madrid. D. Josefa Towers, Director of Formation of Foundation Once. D. Jose Mª Pereiro, Journalist of el pais and The TVE. D. Pinto Juan Luis, Professor of Faculty of Political Sciences of the USC. D. Fernando Salgado, Secretary Xeral de Comunicacio'n of Xunta of Galicia. 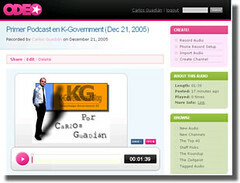 D. Carlos Guadián, Of K-Government, associated Binnacle a "lasideas.org"
Dñ. Lourdes Muñoz Santamaria, socialist Deputy by the province of Barcelona, belongs to the national executive of the PSC. Computer science of profession. Dñ. Marisa Soleto, Director of Foundation Women. Dñ. Montserrat Boix, Journalist. Lawyer in Sciences of the Information by the University of Barcelona. It works in the Informative Services of Spanish Television. Information The International. Foreign policy. The Mediterranean. Magreb. Islam. Investigator, training consultant and in communication, TIC and sort. Creator of Women in Periodic Red/El Feminista, one of the most important networks in Spanish of exchange of information in the Internet on Human rights of Mujeres and Empoderamiento. What takes out again!!! 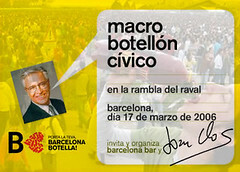 That is what they are going to have many today and is that the call to celebrate macrolarge bottle in the day of it was yesterday a success in many places of Spain where in some of them the things went a little of the hands. It is unusual that the social phenomenon based on social networks using new technologies as Internet and sms is for meeting around a bottle in the street, trying to break attendance records and of course to challenge to the authority in plant of our younger sector. What differentiates with our French neighbors in whom social vindication it is a fact. Although so many months ago also it did not have turned around in France and of much more violent character. At that moment the vindication of isolated young people born of immigration and socially in ghetos showed their inconformidad with the situation that has been called on to them to live. The violence and mainly burns it indiscriminate of vehicles was its characteristic characteristic. Now in France the social problem has extended to all the young people when starting up of the hand of Villepin the Contract of the First Use. Thursday was concentrated more than 250.000 people and the violent expression did not let make its appearance. And in the same way that in these cases sms and Internet by means of forums, blogs and mails in chain they have been used to make the calls and to organize the mobilizations of the macrolarge bottle. This situation lets wish respect to our social awareness and it causes sorrow to me that our only vindication is the one of being able to drink until being satiated and being able to mount all follón that is wanted. I am not saying with that they do not have to look for alternatives so that the leisure can occur. I am the first a the one that it likes to enjoy the friends drinking a glass awhile. But I recognize that to mount celebrations improvised in the street where there are more disadvantages, for which in that zone live, that benefits is not the best way to assure the coexistence all. And it is that we are in the one of always Until where our right gets to do what we want? We will have to consider to which they surround to us or no? Blogs has been the following passage in the diffusion of this one sort, the confidential ones. In this case, in already more than active Catalan blogosfera, the political parties use like diffusion platform all type of information that can attack against its opponents. So and as it is possible to be read in "the space of dircom"no party recognizes its entailment with them. On an average of pages seen of approximately five hundred daily ones, these platforms count on hearings that look for what it says of his and that they look for something about the others. They are platforms with effectiveness between the members of the organization under which they are protected, are platforms that aleccionan and give to slogans and arguments to fidelizar, but mainly to discredit. Administranio is the turn out to describe in chemical terms... Something related to the policy? Alberto in Administrations in Network every day surprises more to me. First incursion in podcasting. I have opened an account in Odeo and the interficie of use that it has is quite intuitive, although I have to still recognize absolutely I am not familiarized with all the possibilities that I believe must offer. Hello, I am Carlos Guadián, I know that some of you already knows me personally and who many other me you know online by contact. Between the habitual readers of K-Government there is people of Argentina, Spain, Peru, Chile, the United States, France, Germany and even from Japan and Indonesia. The truth is that the hearing of this blog has been growing and becoming tensile to many places. You already know that here what to day to day encounter by the network reflected and that this related to the application of the new technologies of the communication and the information to social, political and administrative processes. This that you are listening is first podcast generated and lodged in Odeo. I hope that this new communication channel is of your affability and that it supposes an improvement. I suppose that it will be means that will help me to make agile the information transmission of course and that it will help me to arrive at all you from one more a nearer way. Of course, K-Government follows open so that you prune to give your opinion and through as you prune to continue being the current of everything what interesting, peculiar encounter or that simply the attention has called me. Immediately and until the next one, a greeting. ...The past 12 of December from Própolis we published the first one Monographic of the Most innovating Professionals of the Public Administration in Spain. 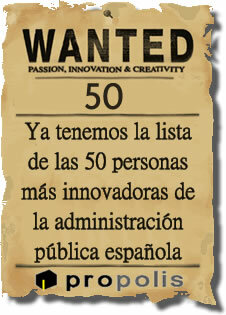 Through as we presented/displayed the 50 people who, by their trajectory within the Public Administration in Spain, more value have contributed in the modernization and the innovation of the same one. The other day listened like Àngel Ros, mayor of Lleida it spoke proud of service of chat that they have started up. Chat in which the every first Thursday of every month makes available of the citizens to solve their doubts directly. It is not bad idea and although always they will be left outside all those that simply they do not have assimilated an intensive use of the new technologies, but I am sure that many citizens will find in this service something very useful since he puts to them to the reach to be able to consult of first hand what he worries to them or he interests with the maximum person in charge of its city. Government has to facilitate all everything possible that the exercise of the vote can be carried out by all its citizens wherever they live. But, up to which point does it have to be facilitated? I think that it has to be facilitated in everything possible, but evidently trying to find the most adequate means and on all the one that is more effective and more efficient. Iñaki in Administracion(es) en red does an excellent description of the characteristics that an e-civil servant should have. ...digital civil servant must be orientated to tasks of markup, as the identification of needs to solve, the evaluation of the lent service and of the reached results and, now that is in fashion, he must also innovate continuously the services. For that, the direct contact with the citizenship, in a permeable attitude and of systematic listening, is essential in such a way that this characteristic is linked closely with the two previous. I agree totally that the public worker every time has to have a more specialized preparation and he of course has to be familiarized with the new technologies and its use totally. Also in the development of new skills and to be capable of providing valuable services. And it is true that with the automation more to the citizen and not so much is going to be able to be dedicated every time to the process by the civil servant. To belong to a network it is, to work in net, more and more important. INEAM with the course "Conceptos básicos para la formulación de Estrategias de Gobierno Electrónico"
The graduate degree from Pompeu Fabra University "gobierno y gestión pública en la sociedad de la información:e-gobierno"
Not only the new technologies are important for the development of strategies of e-Government. The civil servants who are those that are going to drive the machine of the administration have to be prepared for that. Nothing else to say, isn't it? Information in English about ADELE project. A think tank is a research institute or other organization providing advice and ideas on problems of policy, commerce, and military interest, and are often associated with military laboratories, corporations, academia, or other institutions. Usually this term refers specifically to organizations which support multi-disciplinary theorists and intellectuals who endeavor to produce analysis or policy recommendations. A time ago I talked you about Demos and today want to give you reference of other think-tank whose center of research is e-government or treat some directly related subject with it. To form a group of ideas in order to generating opinion, of favoring the transmission of knowledge is one of the best ideas, that is to be able to innovate, about being able to be adapted to every moment. The list that I give you is small and I am sure that will have more groups or institutions that work as a think-tank, if you know about one only you have to add it in the comments. Demos: Demos is the think tank for everyday democracy. We believe everyone should be able to make personal choices in their daily lives that contribute to the common good. Our aim is to put this democratic idea into practice by working with organisations in ways that make them more effective and legitimate. 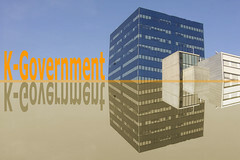 eGise (Reino Unido): The purpose of the eGISE network will be to promote national debate and highlight research strategies to increase understanding of eGovernment, and the processes involved in evaluating decisions surrounding human, organisational and technical components of information society technologies (IST). In particular, the network will explore IST strategies and their embedded mechanisms for evaluation and integration within government and the service or public sector. 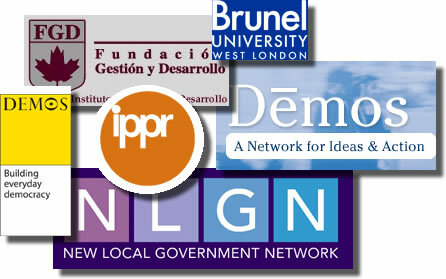 Institute for Public Policy Research -IPPR-: ippr is the UK's leading progressive think tank. Through our well-researched and clearly argued policy analysis, reports and publications, our strong networks in government, academia and the corporate and voluntary sectors and our high media profile, we play a vital role in maintaining the momentum of progressive thought. EL INSTITUTO TECNOLOGIA Y DESARROLLO -ITD-, es un Think Tank Team cuya misión es la de acompañar y brindar aportes para el desarrollo y transición hacia una nueva era: La Sociedad del Conocimiento. Para ello tiene como acciones principales, entre otras, establecer alianzas con instituciones y organizaciones de intereses concurrentes, conformar equipos de estudio, producir investigaciones, estudios y análisis sobre temas de Sociedad del Conocimiento y Nuevas Economía. Technological advance and the citizen capacity to adapt to Information Society give us new keys to improve in e-government. We've spoken sometimes about multiple posibilities that a mobile phone offer us. Citizen participation, politic egagement, activism, payments and a lot of more things. In order to learn about all the chances that we have, we can attend to "MobileActive: Cellphones for Civic Engagement" that it will be held in Toronto, Canada september 22-24. In other way, to learn from user involvement is the best. Is the topic that focused the workshop that it held in Rome the 12 "User Involvement in e-Government development projects". It held in the Interact 2005 with members from SINTEF, from Fraunhofer Institute and from Science and Technology University of Throndheim from Norway. A couple of days ago I commented you that the role of the blog every time is taken more into account in front to the e-Government. Andy Budd writes one interesting post in Blogography "Blogging in Government" where he talks about a session that he attended as lecturer with the members of "government e-communications network". I agree with his point of view. 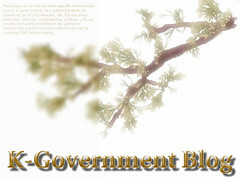 I also see a heap of possibilities for developing the role of Blogs in e-government. "I personally don’t expect to see a rush of publicly facing weblogs in the near future for organisational culture reasons. However I do think the seed has been planted and as the internal culture starts to change over the next few years I see the potential for some very interesting and useful weblogs to develop"
A thing that has surprised me in Peru is the popular use of tin roofs to cover the houses, what paradoxically almost all are made of adobe. A strange combination. Whereas the use of a craft and traditional material as it is the adobe is cheap and affordable for all that one that is lifted a house, the use of a foreign material totally to the culture site as the metal sheet, for the roofs and doors, also complies the same requirements. It is made strange observe two materials that are so different joined in almost indisputable couple in the constructions of the Peruvian Andean high plateau. This duality only breaks as one approaches Cusco, I can imagine that as one approaches the archeological capital of South America the image takes more importance and the use of the tile as substitute of the metal sheet must be favored. I can not say that in view of these roofs it has the impression of seeing comfortable houses, rather on the contrary. I have the sensation that in winter, in period of rains there will be leaks and that in summer that roof will convert them in real ovens. But maybe I make a mistake, since in all the places in those that we lodge ourselves we made it of nice way. Sometimes it does not have to be let take only for the esthetics. Another thing that favors this statement is that most of the houses are of ground floor or at the most they have a flat of height, but almost in all the impression of being unfinished buildings is present. This is due to they leaving to stand out the rods of the one encored above the constructions for whether in a future they have to keep adding flats above. Therefore it is not a sign of thing to means to do but of forecast. These tin roofs that in another country as Morocco would be covered of seas of satellite dishes, in Peru are deserted. The reception of the signal for normal aerial or cable is the solution most accepted by those that have a television set in their home. A so impressed population is not, therefore, for what it appears in the "window", especially in the rural areas, where there are places totally virgins in this sense. Places as Amantaní where there are not asphaltic streets, self-propelled or simply electrical devices as washing machines, television sets or fridges. Because for this the need for use of technology will be accordant with the characteristics of the place. Every place has its own technological needs. Anyway, that dispersed population does not represent more of 45% of the Peruvian total. More of the half cohabit in the great urban block that means Lima. This way the idea that one does not get to be somebody unless it lives in the capital, land of opportunities and only place is reproduced once more where one can progress ¿¿¿ Sure ??? This fact that it has been repeated in the moment in that a society is giving the evolutionary step of being an economy tertiary to pass to a secondary, that is, of basing all the economy on activities of generation of raw materials to be those who transform them. This idea disappears when we pass to be a society of services or of primary sector. It is more, in this stage the need to be refound with the nature again reappears and every time are more those that now carry out the transfer but to the inverse one. Of the city to the field, in search of that quality of life lost in the fast rhythm of life of a great city. That it sees all these contrasts make out me that the evolution of the population and in its way of life is much faster than the one that the organizations and statutory agencies experience. The institutional and administrative rigidity is fort and its rejection to the great change, in many cases for which it interests them to keep maintaining a system of interests and in others simply for ignorance of the profits that of the use of the TIC can obtain. For this type of cases the adoption of mixed techniques, as it does the people as she uses the adobe and the metal sheet, to obtain something that is adapted to their needs is the best solution. The introduction of systems based on the management of the knowledge, the territorial use of information systems or the implementation of managers of reports can help transform at the same speed as its population and therefore answer adequately for its needs. The derived increase of efficiency and efficiency of the administrative transparency due to the increase of the tools of taxation and to the store of responsibilities facilitates a better management. Because for all this I want an administration that is built with the solidity of the adobe, which will maintain better the temperature of the house and which will keep giving use to the people of the place. But I also want an administration that uses the metal sheet as roof, material easy to be used and affordable for everybody. We have to be open to the innovation to improve, but not that's why we have to forget those advantages that only for having a time are considered obsolete. Therefore I do not want an administration that only is let take for the esthetics, I want an administration that works and that uses what has to use, when it has to use it. Step by step conscience of the importance that a tool as the blog has for the political life and of the administration of any country keeps being acquired. In Europe to inaugurate the new site of the European Parliament a series of conferences are held to discuss on the role of the blog in the public administration (from QualityBuzz and ConversationBlog). In another continent, the American one, the most important newspaper of Colombia, el Tiempo, offers blogs to the next presidential candidates in 2006 (from alt1040). - Bel Llodrà in Mallorca referencing the post on digital slavery in "Societat de la informació i el coneixement. 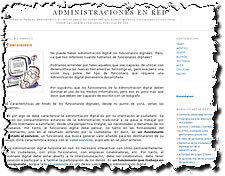 Identitat i reputació digital"
- Arturo de Abornoz from Mexico DF commenting the post on marketing and e-government in "BriefBlog"
- The sindicación of contents in "Dice la Red"
Peru is really a rich country in culture and people. And as not, to say that the extension of callcenters and cibercafés is really important. 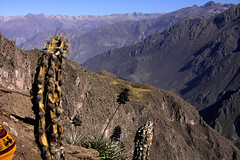 Oneself can find points of connection almost in any place, including the remotest hamlets, as the situated one whole of the Colqa canyon at feet of the Cross of the Condor, which has connection via satellite. The prices are affordable and the use is quite wide, especially between students and young people. I can imagine that the prices of the computers and the connections at home already are not it so much, this is the cause of the existence of this type of infrastructure. In the area of electronic administration, way for going still remains them, but am sure that in it they will be able to find the necessary tools to give impulse to the development that is so desired and especially to eliminate those bad practices that give each other the most usual thing when the measures of control are not. At the moment, they are already preparing the next political campaign for the 2006, where the president Toledo will have to confirm his election in the face of a new reappearance of "Fujimori"... The case is that the main platform of diffusion they are the walls of the houses or the cross walls of the estates that are on foot of road, indicating the ones Peruvian citizens overwhelmed as they have to mark their ballot paper through graffiti fowl and painted. 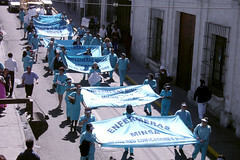 Very few train infrastructure and in power of foreign companies as "orient express" or Telefónica that wins the Peruvian telecommunications, work lacks and abundant protests as that of the university heads of department or the nurses of the service of health, a macro city with important problems of citizen security as it is it Lima and a great rural dispersion with economics of survival mark a country that Inca of the Andean high plateau has inherited the culture. They have very in account the tourism, know that it is a very important source of income together with the exchanges of the immigration, but even that an effective distribution of the wealth materialized in services and infrastructures will not be able to reach the standards of living of the developed countries. At least for the majority of the population, since the concentration of the wealth is in very few hands and the predominant average class in the European countries, in Peru it is almost non-existent. From here all my support to all those professionals that try to improve the living conditions of their own country. Of their tenacity and eagerness for improvement we have to learn to improve our activity of towards us and especially towards them. Further on I will talk to you about two social models that I could observe in two islands of the Titicaca lake. Precisely on as they are organized in Amantaní and Taquile. Community systems in isolated territories but with very different results... And of course also of a puneño film, "The miracle of the Kharisiri" faithful photographs of the situation in which the population in which it lives is in Puno and surroundings. I am preparing the knapsack, this same late I go out bound for Lima. I do not go for professional reason but for holidays. We are going to make a route for lands Incas.